Prior to this project, users could only initiate or join a text-only chat from within Office 365(O365). Due to a lack of integration, users easily missed chat requests and had trouble managing multiple active conversations. We wanted to improve this chat experience by bringing the rich features of Skype's desktop client to the Office productivity suite. Leverage Skype’s rich real-time communication features to connect users of O365 without taking them out of their context. I worked with another interaction designer and a visual designer to propose various integration solutions to fit Skype into the office eco-system while still maintaining its own identify. We collaborated with our counterparts from the Office team in a broader effort to design the next generation of the O365 experience. Where does Skype live in O365? 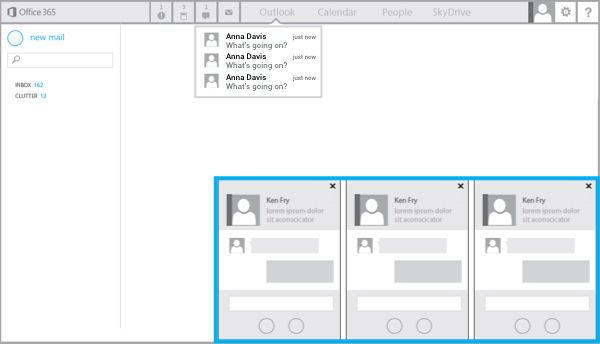 How does Skype interact with other tools in O365? Which Skype features should be available in O365? I started out by surveying the existing interaction patterns in the market and explored a number of options for placing Skype within the O365 frame. 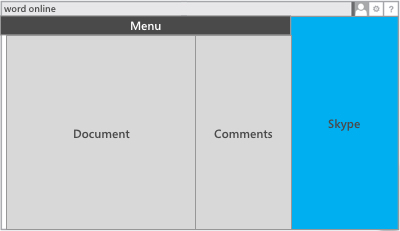 The blue in the following wireframes indicates the new Skype additions into O365. After reviewing the options with the key stakeholders from both Skype and Office, we agreed on proceeding with the final option (option 3). It allows for stronger branding and the side panel design aligns with the exploration Skype had already been doing to keep conversations contextual and scalable. In addition, this side-by-side experience was a strong contender in the O365 redesign as the side panel is a logical place to keep track of a task list and manage notifications. 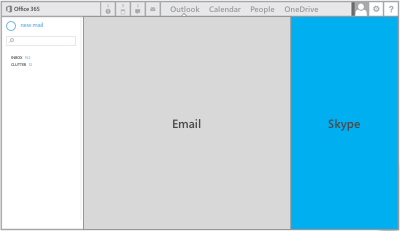 With the side-panel design in mind, I worked closely with a few other Office designers to identify how the communication tools within O365 might interact with each other. First, through a series of exercises, we defined a list of entry points to be considered as well as the combinations of tools a user might be using at any given time. 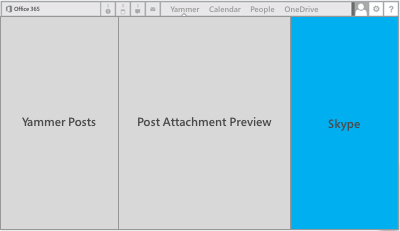 The following are the configurations of tools possible within Outlook, Yammer, or an Office online document. Once we prioritized the configurations based on usage and business needs, we examined the specific interactions that are possible. For example, we considered how a user might share an email attachment into a Skype conversation, or how users can reference specific comments on a collaborative document while chatting over Skype. Although none of these interactions were key to Skype's initial integration, this exercise helped us to establish a point of view on the direction of the product. Once we limited Skype to a side panel and understood the different interactions it might have with the other components within O365, it was time to explore which of its functions should be accessible in O365. I started out by identifying the main features within O365. I then compared them with Skype features to understand points of intersection between the two. The team agreed that Skype in O365 should provide a stream-lined set of features to enhance the communication and collaboration in the context of emails, yammer posts and online documents. For the richer and more immersive experience, we wanted to encourage the users to instead use the standalone client. This was a business decision and a way to keep the Skype component lightweight. As a result, we prioritized the features to include only those that make the most impact within the O365 environment. Through multiple iterations, I presented the following options to the team. After multiple iterations and reviewing with various stakeholders, we picked option 2 because we believed that the simpler navigation is more suited to the complex environment of O365. Also, the second option better serves the use cases specific to O365, where there are many external entry points to chat and Skype should play the role of a companion tool. The following is the final design we delivered. It has a 2-tiered hierarchy that was presented in option 2. We made further simplifications in consideration of the overlaps between Skype and O365. For example, the IM request section was removed because O365 already has its own notification system.